Will the Hasselblad H3DII be as good as the Sinar Hy6 or Leaf AFi? Will the Hasselblad H3DII medium format digital camera be as good as the Sinar Hy6 or Leaf AFi? The Hasselblad H3DII reminds me of other products that are refinements of earlier models. The HP Designjet 5500 was the same identical printer as the HP 5000 except for new firmware (software) and one new feature that actually did not work. In other words, the model 5000 and the model 5500 were the same identical wide format printer. Not much changed except for the model number. I had two of the original model 5000’s and one of the 5500. This was my first recognition of the reality in the world of products: if it’s too expensive to build a new machine, then simply take the old one and give it a new model number. The NUR Tempo Q (flatbed UV-curable inkjet printer) is a refinement of the NUR Tempo II which is the same as the NUR original except for a few refinements and software tweaks. In other words, it is the same as the original model of several years ago except for the model number and software improvements. Another reason a new model is created is if the first model has serious glitches: the H1 definitely had problems. I asked a friend if I could buy her H1 and she said yes, but it was in the repair shop. I checked around and learned that yes, the H1 did have a few issues. So the H2 was needed. The same story seems to be playing out with the Hasselblad H3DII. It would be too expensive to create an actual new and different camera. So they take the same old camera of many years ago (H1) and tweak it. First tweak is renamed the H2, second “new model” is called the H3, and once the competitors came out with their new model, Hasselblad had to respond with something “new” so they renamed a new version the H3DII. This would be okay, except that Rollei has created a totally new camera. The Sinar Hy6 and Leaf AFi. 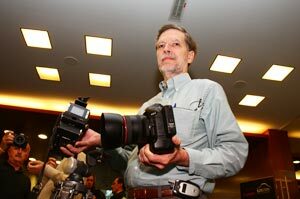 And how will the Hasselblad H3DII camera compete with the Canon EOS 1Ds, Mark III? Hasselblad defines their quality as based on resolution, natural color, optical purity, clarity, and detail. This is the best definition of medium format quality and can simultaneously explain to users of 35mm cameras why so many thousands of professional photographers prefer medium format cameras. If you use primarily 35mm, Nikon or Canon (FLAAR has both), then it’s hard to explain the difference because only once you use medium format on a regular basis, and then return to 35mm, do you notice the differences. 40 years ago I used a Leica: I had about five of them. Then I bought a Hasselblad, then another Hasselblad, then another (two ELX models, one for color, one for B&W backs; and one SWC). Yes, of course you could change the backs but during a busy day it was simply easier to have two cameras. The point is, that medium format film was so much better than 35mm film that there was simply no comparison. It’s the same with large format: once I moved to 4x5” film (9x12 cm), I realized that medium format could not match that. Then I moved to 8x10, and learned how much better it was than medium format. So I have a bit of experience with comparing film formats. 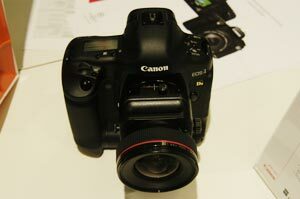 In digital capture I have two 48 megapixel large format BetterLight cameras, an 80 megapixel Cruse, several Nikon digital SLRs ( D100, D200 and am about to acquire a D300), a Canon EOS 5D, and just finished test driving a Canon EOS 1D Mark III. When I need a 335mm camera, then 35mm is great. But when I need a serious camera, I use a medium format (currently am upgrading from a Phase One P25 to a P25+.